I hope that you enjoy these Carnival Victory Cruise photos, as much as I enjoyed taking them and now sharing them with you. These pictures were taken on a recent 5-day Western Caribbean cruise to Ocho Rios, Jamaica and Grand Cayman, Cayman Islands. Carnival Victory leaves Port of Miami and the MSC Divina. A ship's atrium is one of the first things I look for, after boarding. While beautiful in its own rights, I have seen better looking atriums than Carnival Victory's. Dining is one of the main things onboard. With food available around the clock, much time is spent eating. Below are photos of one of two main dining rooms and buffet restaurant. My family had the honor of meeting the captain of Carnival Victory on the evening of the Captain's Celebration (elegant night). Carnival Victory currently sails out of the Port of Miami. Its itineraries include 3-day and 4-day cruises. You will find a mix of Bahamas and Western Caribbean cruise sailings with this ship, visiting ports of call such as Nassau, Key West and Cozumel. 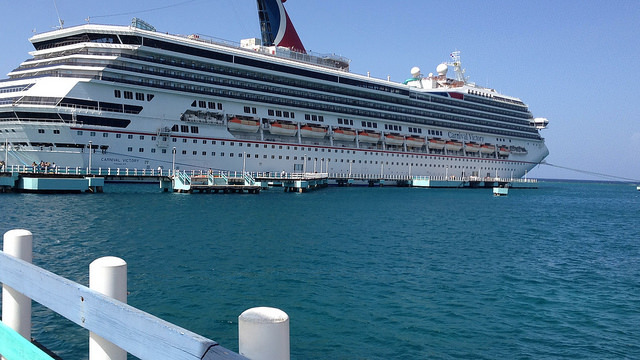 We were on a 5-day cruise that visited Ocho Rios and Grand Cayman. Below are photos from those two ports of call. The photos above show a view of the Ocho Rios Bay from an open deck on Carnival Victory, a view from inside the Ocho Rios Cruise Terminal and pictures taken while climbing Dunn's River Falls. The photos taken in Grand Cayman feature a stop at Dolphin Discovery, inside the Grand Cayman Cruise Terminal, riding the tender and pictures of the beautiful Seven Mile Beach. As I began by saying, I hope that you have enjoyed these Carnival Victory cruise photos. I took almost 1,000 photos on this recent cruise ship vacation. I did that because I like to take pictures and I also wanted to have something to show someone like you searching for photos. It is not impossible to show you all of my photos here, but I have given you enough which will hopefully spike your interest in booking a Carnival cruise. 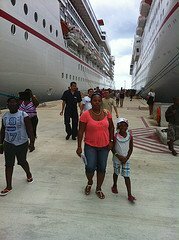 If you desire to book your own Carnival or any other cruise vacation, use the search box below or visit PetesTravel.com. I hope that you will go have fun on the high seas!